Analyst Tristan Gerra is forecasting “eight consecutive quarters of gross margin and EPS contraction,” prompting him to slash his target on the stock from $75 to $32. Through Tuesday’s close shares of Micron are down 34.9% in the last six months. Virtus Financial’s Joe Terranova is watching Intel since unlike its competitors it’s higher for the quarter, while Douglas C. Lane’s Sarat Sethi likes Nvidia after its significant pullback. Chip stocks have been hit especially hard amid the broader sell-off in technology names. And one of the sector heavyweights -- Micron -- is really feeling the pain. The stock is down 44% from its 52-week intraday high of $64.66, and some think there's no end in sight. On Tuesday Baird analyst Tristan Gerra downgraded the company to underperform. "Continued deterioration in both DRAM and NAND pricing leads us to model eight consecutive quarters of gross margin and EPS contraction," Gerra wrote in a note to clients. He also slashed his price target on the stock from $75 to $32. Micron closed at $36.12 on Tuesday, which means Gerra sees another 11.4% downside ahead. Investitute co-founder and "Halftime Report" trader Pete Najarian owns Micron and is sticking with it because he believes the pricing pressure thesis is already reflected in the stock's price, and also because he likes the company's management team. "We all know with DRAM and NAND there's going to be some pricing pressure...But I think the management team you've got right now at Micron is different than it has been in past years. I think going forward they're navigating this better," he said on Tuesday's "Halftime Report." He also disagreed with the analyst cutting his target by more than 50%, saying it felt "a little extreme." Micron soared 87.6% in 2017, but so far is down 12% for the year. And while Najarian remains bullish on Micron for the long-term he's not adding to his position just yet. He noted that the stock "could go down a little further" but that he thinks "we're getting close to a bottom here." Micron's move lower follows a broader sell-off in the chip space as investors worry about potential oversupply. The SMH, an ETF that tracks the sector, is just about in bear market territory, falling 19.8% from its 52-week high of $198.84 on March 13. Virtus Financial's Joe Terranova attributes the leg lower to a slowdown in capex spending. "If you're going to get capex contracting it's going to impact technology, and it's certainly going to impact the semi names," he said. Within the space he's watching Intel since it's bucked the broader trend, posting a 7.7% gain over the last month. "I don't own it [Intel], but it seems to be holding up pretty well. Maybe some of the hot money that was in AMD, Micron, the other high-beta chip names is hiding out in Intel right now," he said. Another high-flying chip name that's been hit hard this year is Nvidia. The stock has plummeted nearly 30% this month after missing revenue estimates and cutting guidance. 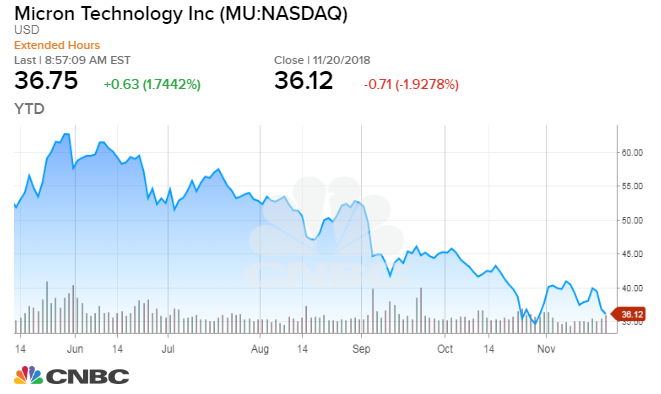 Despite the drop, Douglas C. Lane Managing Partner Sarat Sethi says this is the chip name to buy if putting new money to work since they're developing technology for AI vehicles.